1. On Friday, February 2nd, students at Central Primary School celebrated the 100th day of school by participating in various activities using 100 items. Teachers adjusted their regular schedules so students could take part in celebrating this special day. Students had a great day engaging in fun activities! 2. January Golden Apple winners, Kate Norburg and Kendra Hartman passed on their awards during our February faculty meeting. Lori Cunningham, special education teacher, and Julie Zimmermann, first grade teacher, earned the Golden Apple awards for their willingness to support students and staff as well as their commitment to building relationships with those students and staff with whom they work. 3. 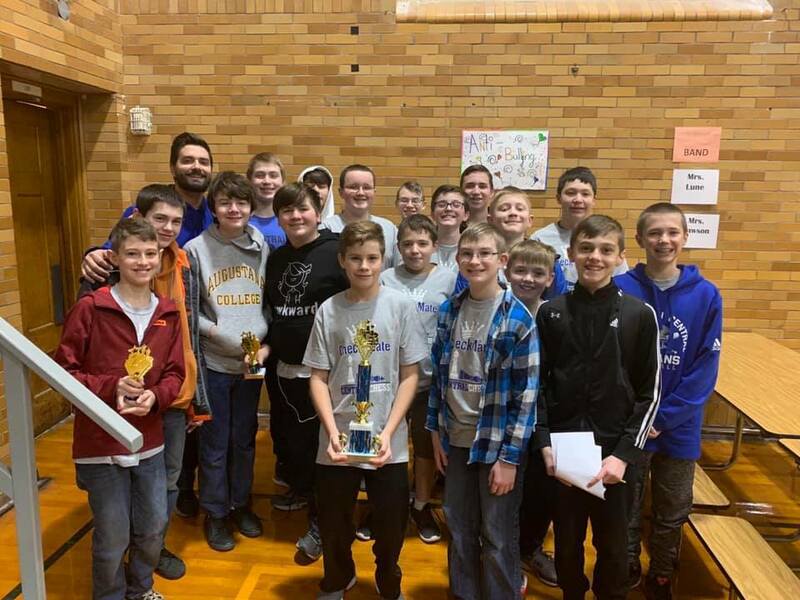 Congratulations to Mr. Lawson and the CIS Chess Team for winning 2nd place as a team at the VonSteuben Chess Tournament on February 2nd. 4. The CIS 8th Grade Boys Basketball Team defeated a tough and determined Eureka Middle School Team to win the Sectional title and advance to the State Tournament in Tolono, IL. Saturday, February 9th. Congratulations coaches Uftring and Joop and the team for a great win! 5. The 3rd Annual Washington Central School District 51 Trojan Gala is taking place Saturday, March 2, 2019 from 5:30p-10:00p at Five Points Washington. The event is $60/person. This event strives to raise funds for wishlist items and teacher grants. The net proceeds will benefit Central School District 51, through the Central School Fund, a dedicated fund of the Washington Illinois Area Foundation, an Illinois not-for-profit corporation. Click here or go to: https://www.signupgenius.com/go/409044ca5a622aaff2-central if you would like to RSVP for the Trojan Gala!